Few teams had won as consistently over the course of a decade as the Indianapolis Colts as they entered the 2009 season. They had missed the playoffs just once in the previous ten years, winning the Super Bowl following the 2006 campaign. It was no different in ’09 as the Colts won their first 14 games and topped the AFC South with a 14-2 record. 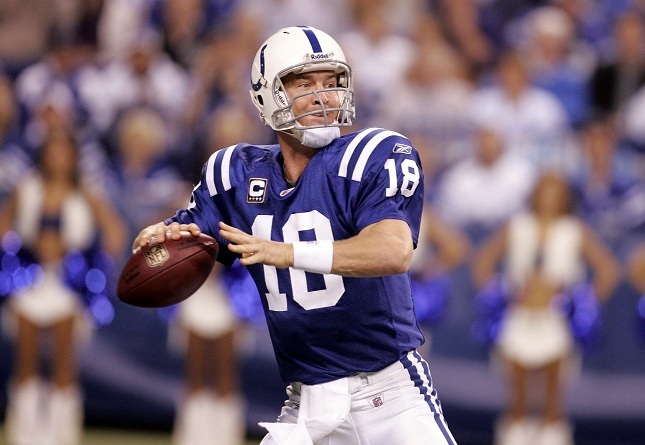 33-year-old QB Peyton Manning (pictured above) was the one constant during the whole period, and he had another MVP year. 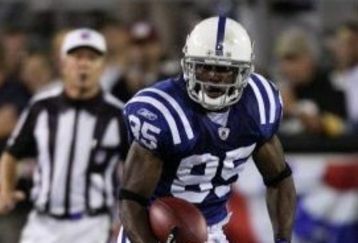 The team had a new head coach in Jim Caldwell, replacing the highly-successful Tony Dungy, and while slashing RB Joseph Addai was still the top runner, and WR Reggie Wayne and TE Dallas Clark were offensive stalwarts, two younger wide receivers, Austin Collie and Pierre Garcon, broke in with good results. Meanwhile, the defense had stalwarts in ends Dwight Freeney and Robert Mathis. Indianapolis rolled over the Baltimore Ravens in the Divisional round of the playoffs. The team they faced for the AFC Championship on January 24, 2010 was the New York Jets. New York also had a new head coach in Rex Ryan and a talented and aggressive defense to go along with a run-oriented offense directed by rookie QB Mark Sanchez. The brash Jets had finished strong in the regular season (including a win over the Colts, who pulled their starters in the second half) to qualify for the playoffs as a 9-7 Wild Card team and, in the process of winning five straight road games coming into the contest at Indianapolis, had beaten the Bengals in the first postseason round and Chargers at the Divisional level. There were 67,650 fans in attendance at Lucas Oil Stadium. The Colts punted following the first series of the game and the Jets responded with a 45-yard drive into Indianapolis territory. Mark Sanchez had completions of 14 yards to WR Jerricho Cotchery and 20 yards to WR Braylon Edwards but lost five yards on running plays before Jay Feely missed a 44-yard field goal attempt. The teams traded punts but the Colts were driving at the end of the opening period. On the first play of the second quarter, Matt Stover booted a 25-yard field goal. However, the Jets responded quickly on their next play from scrimmage when Sanchez connected with Edwards on a play-action pass for an 80-yard touchdown. With the successful extra point, it was 7-3 in favor of the visitors. Indianapolis came back with a long sustained drive of 79 yards in 12 plays. Manning completed passes to Reggie Wayne for 25 yards to get into New York territory and then, in a third-and-two situation at the 26, to Austin Collie for 22 yards. The Jets defense held, however, and the Colts settled for Stover’s 19-yard field goal to make it a one-point game. The Jets drove 77 yards in seven plays in their next series. RB Shonn Greene started off with three straight runs for 20 yards before WR Brad Smith, operating out of the team’s “pistol” formation, threw to Cotchery for a 45-yard gain to the Indianapolis 12. Three plays later, Sanchez passed to TE Dustin Keller for a nine-yard TD and the Jets opened up a 14-6 lead. It got worse for the Colts when Joseph Addai fumbled on the next series and the Jets got the ball back at the Indianapolis 29 thanks to the recovery by SS Jim Leonhard. But a false start penalty on the Jets, combined with the stingy defense, moved them back and New York got three more points on a 48-yard field goal by Feely. The Colts got the ball again with 2:11 left in the half and wasted little time in putting points on the board. Following an incomplete pass on first down, Manning connected with Collie (pictured below) three straight times, first for 18 yards, then 46, and finally 16 yards for a touchdown. The teams went into halftime with the Jets leading by 17-13. New York had the first possession in the third quarter and drove to the Indianapolis 34, with the big play a Sanchez pass to Cotchery for 17 yards. But the Jets came up empty when Feely’s 52-yard field goal attempt was wide to the right. The Colts responded with a 57-yard series in eight plays. All were passes by Manning, the last being a four-yard toss to Pierre Garcon in the rear corner of the end zone for the go-ahead touchdown. The teams traded punts until, in their first possession of the fourth quarter, the Colts put together another scoring drive. Manning threw to Dallas Clark for a 15-yard TD and, with Stover once again adding the extra point, Indianapolis was in front by 10 points. The Jets went three-and-out in their next series and the Colts came back with a long scoring possession of 71 yards in 12 plays. They converted two third downs along the way, the second with a Manning completion to Garcon for 23 yards on a third-and-nine play. The drive burned 5:33 off the clock and concluded with Stover booting a 21-yard field goal. Down by 13 points with 2:33 remaining, the Jets were finished off when a Sanchez pass was intercepted by CB Kelvin Hayden. The Colts won the AFC Championship by a score of 30-17. Indianapolis gained more total yards (461 to 388) and accumulated more first downs (27 to 17). New York’s running game was held to 86 yards and the Jets were penalized six times, to just one flag thrown on the Colts. Each club turned the ball over once. Peyton Manning completed 26 of 39 passes for 377 yards with three touchdowns and no interceptions. Pierre Garcon (pictured below) caught 11 of those throws for 151 yards and a TD and Austin Collie gained 123 yards on his 7 catches that included a score. Joseph Addai paced the ground game with 80 yards on 16 carries. For the Jets, Mark Sanchez was successful on 17 of 30 throws for 257 yards and two TDs with one intercepted. Jerricho Cotchery had 5 catches for 102 yards and, thanks to the long scoring reception, Braylon Edwards gained 100 yards on his two catches. Thomas Jones rushed for 42 yards on 16 attempts and Shonn Greene added 41 yards on 10 carries. The Colts went on to lose the Super Bowl to the New Orleans Saints. They had a tougher time in 2010, but once again topped the AFC North. The Jets were again a Wild Card team at 11-5 and defeated Indianapolis in the first playoff round on the way to once more reaching the AFC title game, which they lost to the Steelers. Things would change significantly for the worse for both clubs in 2011.